Click on the photos to make them larger. heavens on a serene summer's eve. A satellite streaks across the sky during this 10 minute, unguided astrophotograph taken at Star Hill Inn, near Sapello, New Mexico, while a great spaghetti dinner was being enjoyed inside. 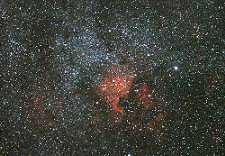 The Milky Way is plainly visible cutting across the center of the image. The van door opened momentarily. LIGHT, followed by profuse apologies... I couldn't get angry because I knew it was just the right amount of light. Observing at 4:00 a.m. in Big Bend National Park, this photo was made with a 16mm full frame fisheye lens. The moon at night is big and bright--and not just in the heart of Texas. It's also quite a sight in New Mexico at Star Hill Inn. I originally came here to just look at the dark sky, but I slowly began to realize that the sky can be splendid even under the moon's light. The bowl of the Big Dipper is scooping low. 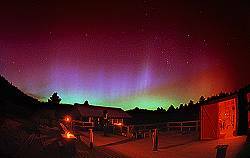 Auroral displays occur when electrical currents discharge in the upper atmosphere causing the air to glow. They are directly related to the earth's magnetic field and solar activity. 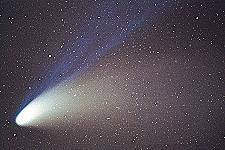 This auroral portrait was captured on the morning of November 7, 1971 from Pulpit Rock Astronomical Park, near Hamburg, PA.
A two minute guided photograph of Comet Hyakutake, taken at Pulpit Rock, near Hamburg, PA on the very windy, frigid night of March 23, 1996. Note the blueness of the gas tail. 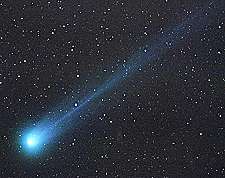 By the 27th the comet's tail stretched more than halfway across the heavens from dark sky locations in the Southwestern US. This Perseid meteor was captured at 12:58 a.m. on August 13, 1971. 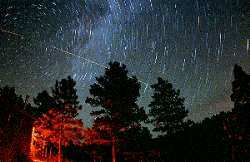 Perseids are the result of dust from the tail of Comet Swift-Tuttle entering the earth's atmosphere. 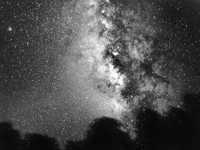 With regularity, peak activity occurs each year during the morining hours of August 11-13. My best meteor photo was snapped at 02:21 a.m. on the morning of August 15, 1971 when a sporadic popped out of the darkness and registered on my film. Its sputterings, which all happened within a half second, are still vivid in my mind, as well as on the photo. My first night at Star Hill Inn, high in the Rocky Mountains of NM, presented untold wonders to my eyes and lenses. The stobe-like flash reflected from the ground while shooting the Big Dipper will always be remembered. 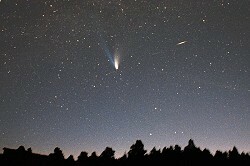 Only my camera witnessed the fireball which created it--8/12-13/1988. The Great Pyramid of Khufu (Cheops) served as the backdrop for a spectacular solar halo which was witnessed from Giza late on the morning of January 6, 1982. It was my last full day in Egypt. May be pyramids were pharoah's stairway to heaven. The 22 degree solar halo is winter's "rainbow." Unlike its summertime counterpart, the solar halo is caused by the refraction of sunlight through ice crystals rather than water droplets. It is much less colorful than the rainbow. This halo was seen on April 24, 1974. This large double rainbow appeared near sunset after a brief summer shower during travels through Arizona's Canyon de Chelly. The primary bow at its base was nearly 84 degrees wide, while it towered more than halfway into the northwestern sky. The image was captured with a fisheye lens. Rainbows can only occur when the sun is 47 degrees or closer to the horizon. If the bow is created by a high sun, like it was in this 1988 photo of Cliff Palace (Mesa Verde National Park in Colorado), the arc appears small and near the horizon. 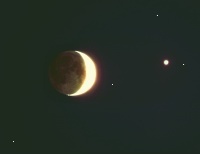 Conjunctions of the moon and planets are rarely as spectacular as this April 19, 1988 event where Venus and the Moon were separated by less than one half degree. Hazy sky conditions added a surrealistic quality to this 15 second exposure. Note the earthshine on the unlit portion of the moon. 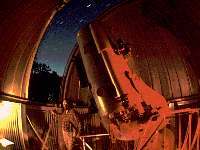 This 32 second exposure of the conjunction of Venus and the Moon was taken at Kutztown University Observatory on the evening of January 22, 1988. A 500 mm lens stopped down to F/8 was used with ASA 64 film. Venus was distinctly visible to the unaided eye about 30 minutes before sunset. Conjunctions between planets can also be interesting to observe and are easily accessible to urban observers. In the February 14, 1975 photo on the left, brighter Venus is below Jupiter. Just one week later, on the 21st, it's easy to see that Venus had passed Jupiter. These images were taken about one mile from center city Allentown (PA). The moon moves its own diameter during the interval of an hour. These two exposures, taken over a period of 31 minutes on April 19, 1988 were guided on Venus. The crescent moon to the right was recorded at 8:56 p.m. while the one to the left was imaged at 9:27. The moon's orbital motion carried it eastward about 1/4 degree during this time period. 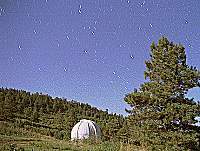 The moon can be easily seen in the daytime if sky conditions are clear enough. That's not hard to create in the Teton Mountains of Wyoming. After taking this exposure, my friend, Allen and I set up my small Questar telescope and observed climbers walking across sun-drenched ice fields. Earthshine results when light reflected from earth faintly illuminates the nightside of the lunar hemisphere facing us. It is best seen when the moon is a thin crescent. These images (6 sec. and 27 sec. respectively) were recorded after sunset on March 25, 1974. Once you've seen one lunar eclipse, you've seen them all. RIGHT!!! Note the differences between the December 9, 1992 and the November 30, 1993 total lunar eclipses. Every event is different. The twilight wedge can be seen in the direction opposite to the setting sun. It is the earth's shadow being projected into space. The shadow continues to rise after sunset, eventually disappearing against the inky vault of approaching darkness. The sun peeks from the top of Candlestick in Monument Valley, Utah, demonstrating how it obtained its name--1975. The area is a surreal combination of mesas, sentinel buttes, and isolated pinnacles, deep red rock contrasted against saturated blue skies, scorched by the sun and serenaded by drying winds. In a way it is the best and the worst of what land could possibly have to offer. 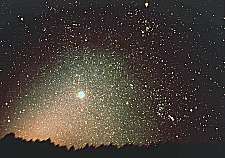 The sky begins to light up about 20 seconds before the end of totality (7-11-91). The red on the horizon represents regions just outside the boundaries of totality receiving only the redder illumination from the sun's limb. 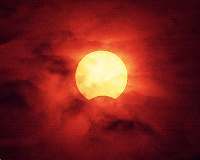 This partial solar eclipse seen on December 24, 1973 was witnessed from the front yard of my parents' home in Allentown, PA. Increasing cloud cover seemed to be ready at any moment to obscure the sun, but it never quite happened. Instead the clouds gave this eclipse its own unique luminescent signature.